Each evening when we take Meera for a walk, we stop by the Poornima Juice Center on Colaba Causeway, for their freshly squeezed ganna ras (sugarcane juice). At 8 rupees (16 cents, US) a glass, it’s a steal. Meera greedily gulps it too. As a baby, this was the first juice we gave her. This goes superbly well after ingesting some spicy vada pav, or batatavada. See this photo essay on making jaggery from sugarcane juice, in rural karnataka. This pic is from last November, when Pakistani terrorists struck havoc in Colaba. Then this store (right across the main street from Leopold Cafe) stayed closed during the curfew. 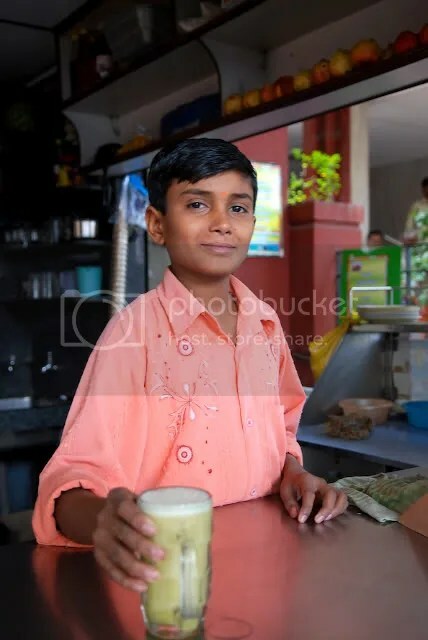 When it re-opened, I was one of the early customers and this kid was happy to serve me. Such small family businesses were hurt most by the terror strikes and associated curfew. Video: Weaving Jaaii flowers in Honavar. Video: Making Puran Polis – A South Indian delicacy.